Join our Tiny Turkey Trot Kids Run! This fun run is for ages 12 & under. It’s an untimed run that is approximately 200 yards long. We’ll start as soon as the last 5K participant crosses the finish line, approximately 10:15AM. The race will begin close to the 5K finish and will go in waves (9-12 year olds, 6-8 years, etc.) Please listen for the DJ announcement for the race to begin. All kids will receive a short sleeve cotton shirt, finisher medal, goodie bag and mini pie! *Pie, medal and goodie bag will be given at the trot finish line. 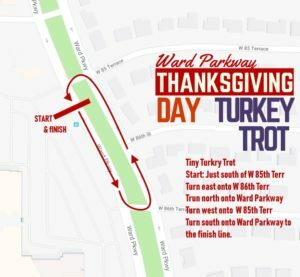 Parents are welcome to run alongside their tiny turkeys.